← Strange but True: Albuquerque Calendar has 300 Sundays ! How can that be? The Gregorian calendar we use in the Western World today typically has 4 Sundays a month (5 depending on the month), but in 2014, there will be 52 Sundays. However, Albuquerque, being a little quirky, doesn’t necessarily like to have only 52 Sundays, so based on the averages, we will probably have between 275 and 300 Sundays this year. Oh, whoops. Make that “sun days”! New Mexico ranks 4th in the number of days of sunshine annually (ahead of us are Arizona, California and Nevada), and depending on which part of the state you live in, the number of sunny days can range from 250 to over 300. Now, that’s a solar paradise! A couple of years ago, gazing at yet another sunny day, I was determined to purchase a solar cooker and take advantage of all of this free power. 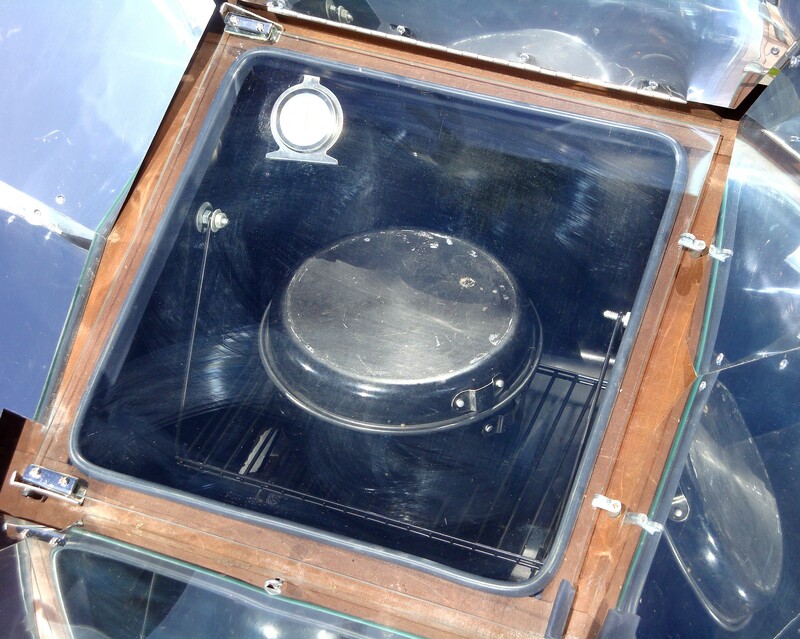 The general premise is that if you live between 60 degrees north latitude and 60 degrees south latitude, you can cook in a solar oven. 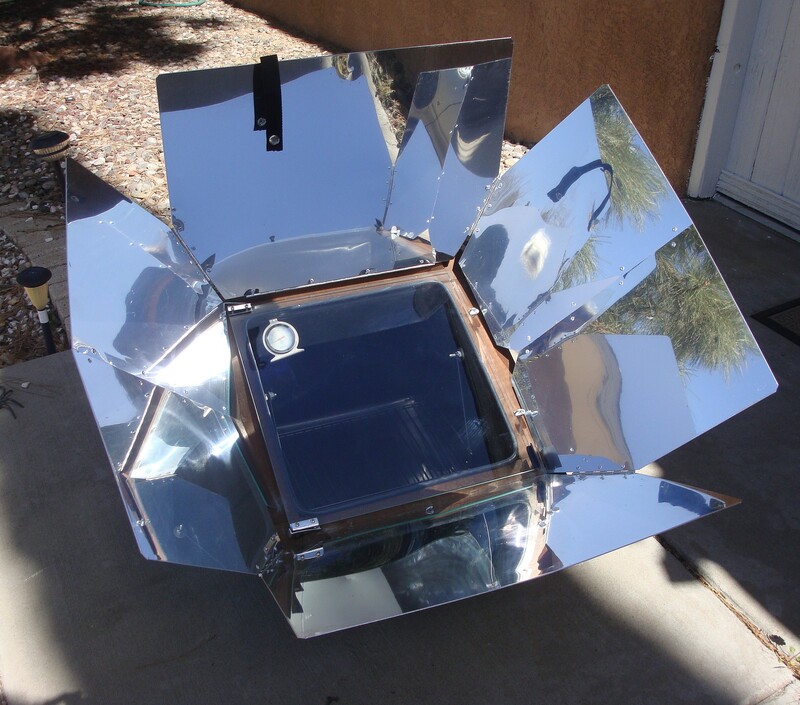 Albuquerque is at 35 degrees north and is in a great spot for solar cooking. Altitude also has some impact: we receive more solar radiation at 5,200 feet than at sea level, however, the advantage is offset by longer cooking times (due to barometric pressure). 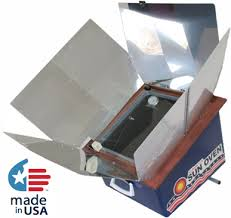 After doing some research, I settled on the Global Sun Oven, manufactured in the US by Sun Ovens International, Inc. 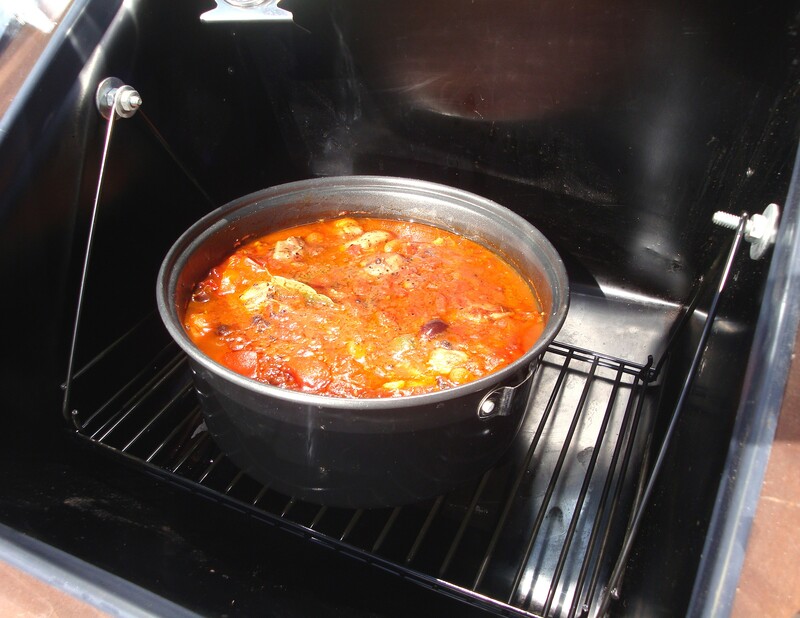 The oven is very easy to set up and use and can even be used on cloudy days, although cooking times will be longer. You can set it up early and point it in the direction, where the oven will get at least 3 to 4 hours of direct sunlight, and like a slow cooker, the food won’t burn and will still be hot when you get home from work. 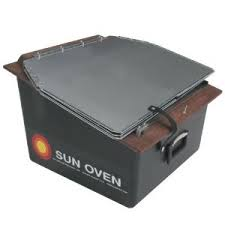 There are a number of great books out there on solar cooking and Sun Ovens International has a great website, with video tutorials and a wide selection of recipes as well. The recipe I used yesterday was from “Cooking with Sunshine” by Lorraine Anderson and Rick Palkovic, published in 2006. 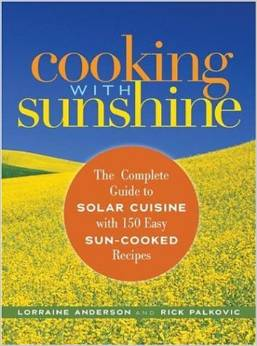 Other good books include “The Sunny Side of Cooking” by Lisa Rayner (2007), which features vegetarian and grain based recipes. Specifically for the Southwest is “The Solar Chef” by Solar Ranch (2009). An older one, published in 1978 is “The Solar Cookery Book” by Beth and Dan Halacy. 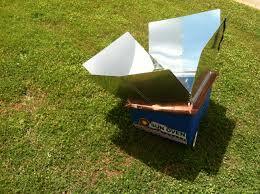 There are also a number of good books on solar cookery in general and how to build your own solar cooker. “Heaven’s Flame” by Joseph Radabaugh is a good one. 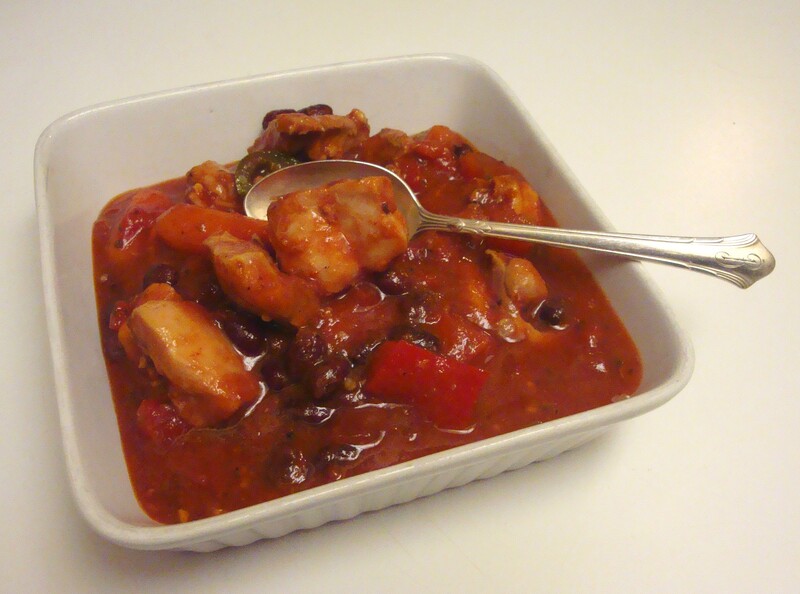 Place the beans, tomatoes, carrots, bell pepper, olives and chicken chunks into a dark 2-quart casserole. 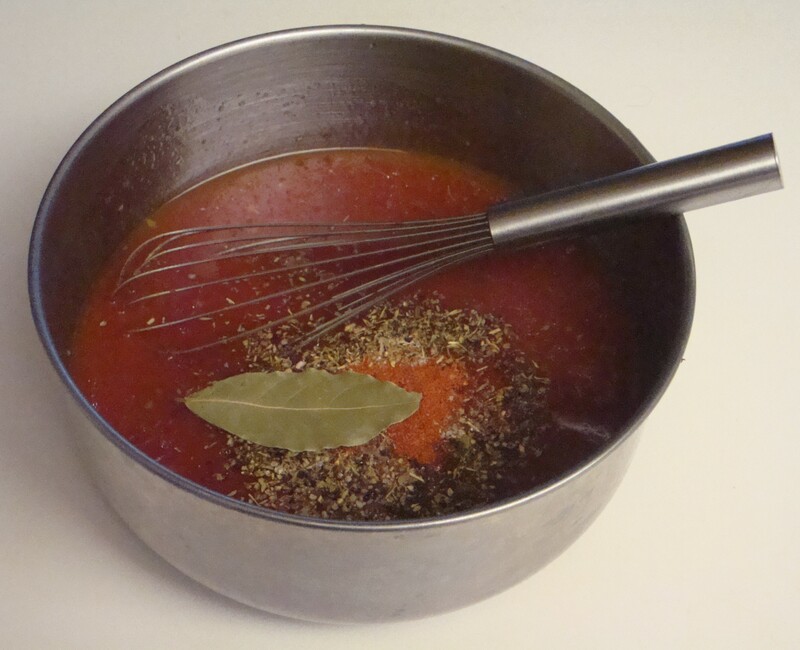 To make the sauce, whisk together the oil, tomato paste, wine and broth. Mix in the garlic, basil, thyme, oregano, salt, pepper, cayenne and bay leaf. Cover and bake for 3 to 4 hours in the solar cooker, until the carrots are tender and the stew is bubbly. (Note: I made a couple of substitutions: black beans (I had no navy beans), a red pepper in place of a green one and I also added a chopped and seeded jalapeno just to zip it up a bit. The recipe specifies a 6 ounce can of tomato paste, but I found this to be a bit overpowering and next time, I’d use about a half to two thirds of a can. 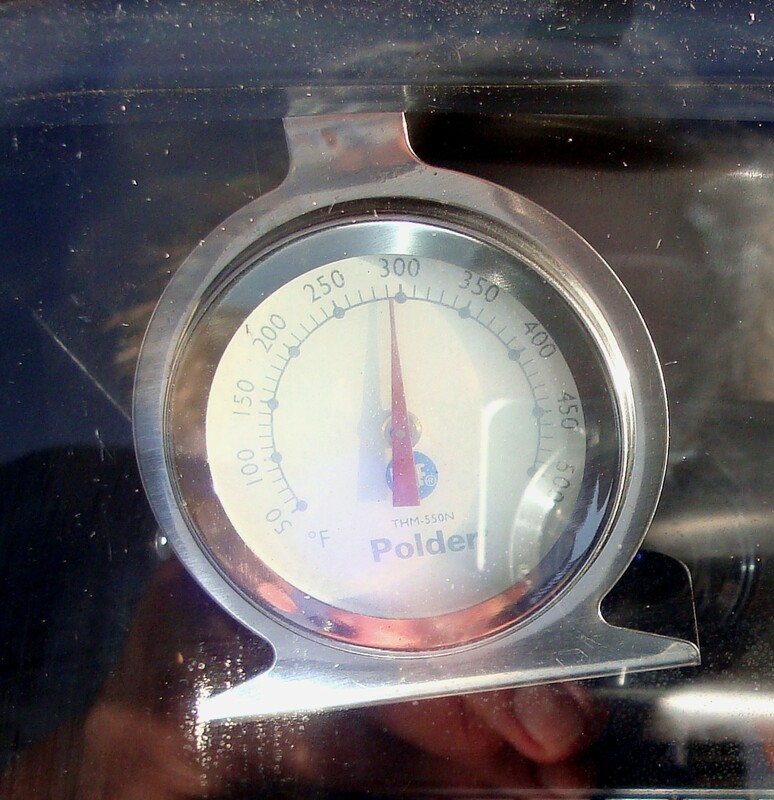 While not essential to preheat your solar oven, I usually put it out about 30 to 45 minutes ahead of when I want it to start cooking, in order to raise the temperature. 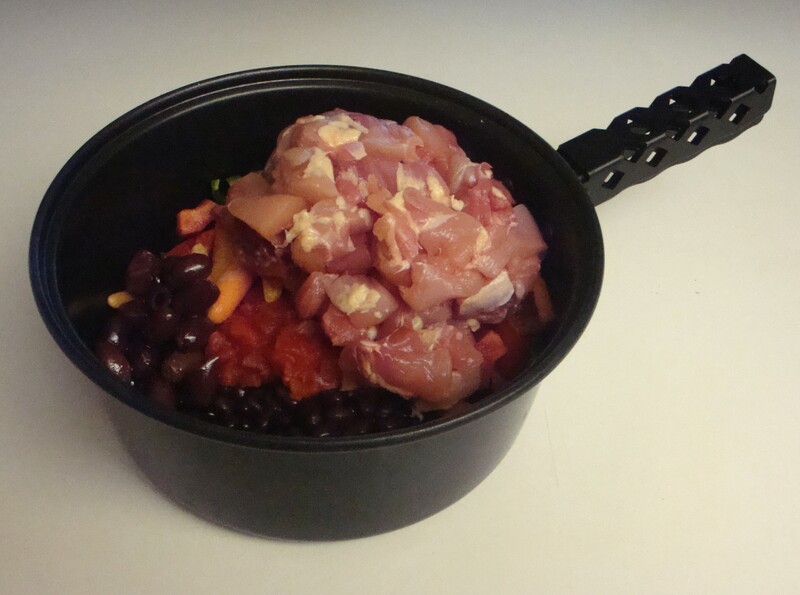 As soon as you put your food in, you’ll see the temperature drop for a while. 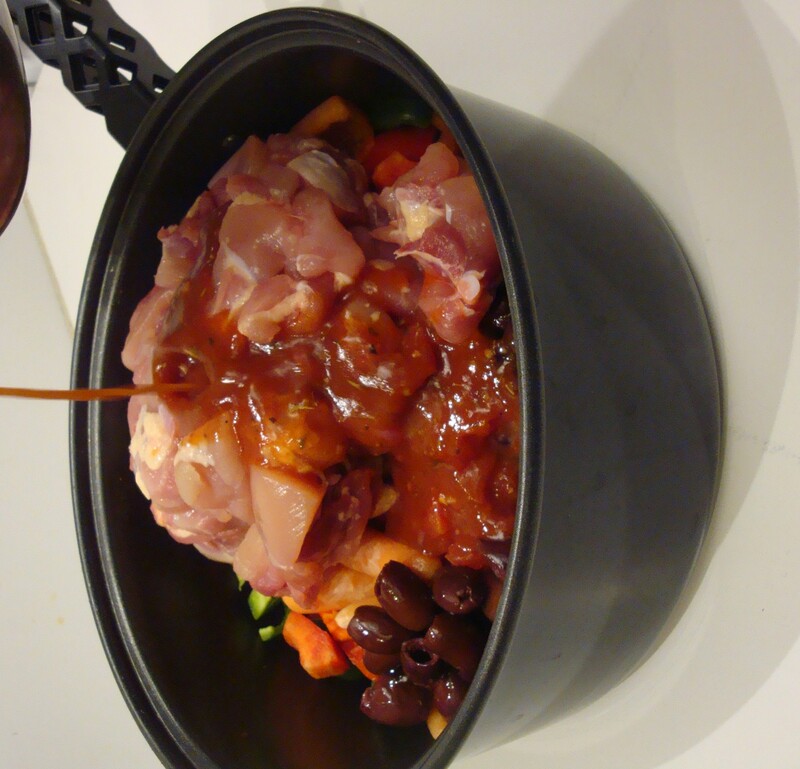 For the recipe above, the highest cooking temperature reached was 325 degrees. 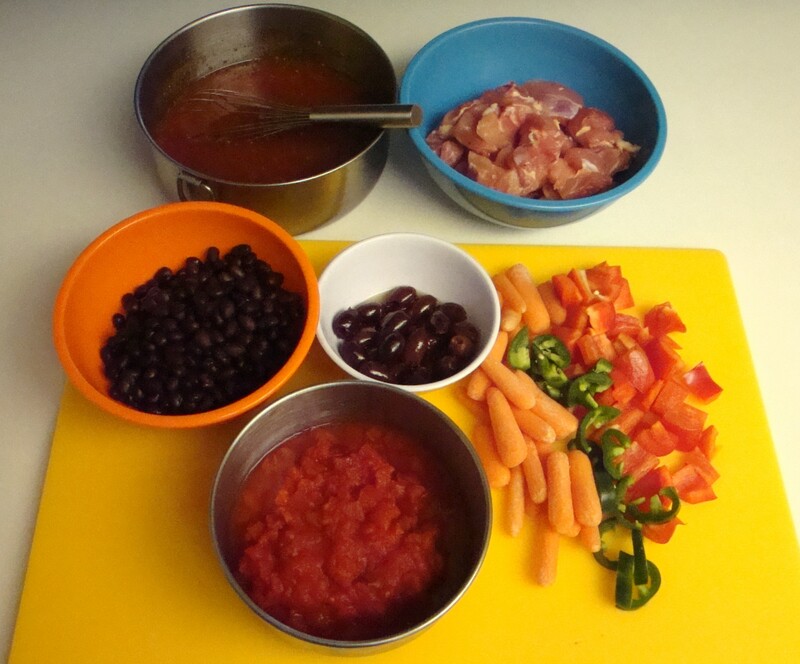 This will vary from recipe to recipe, how large your container is, etc. Higher temperatures can be achieved. Although it’s hard to time the oven, by ‘refocusing’ the oven every 30 minutes or so to track the sun, you can control how long the food will cook. Even if you don’t refocus, or it becomes cloudy, the food will still cook, but it will just take longer. Foods don’t burn in the cooker as the heat is very even. Stirring is not necessary. 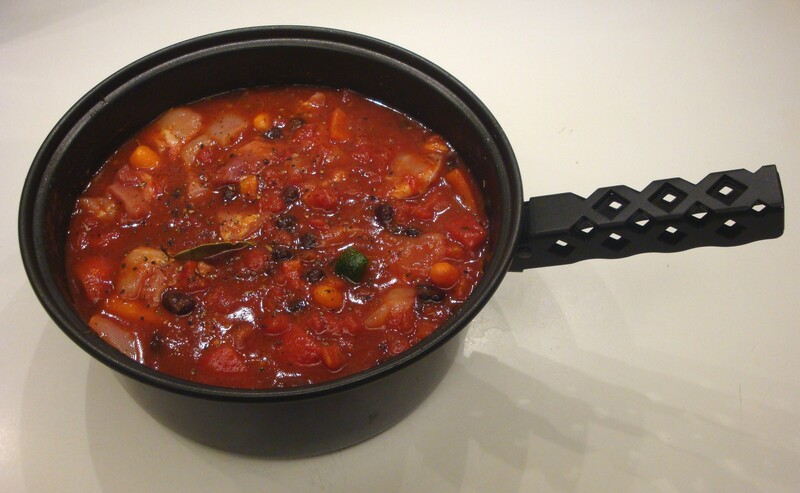 It is important to use dark (black is preferable) cooking pots, as they will absorb the heat better. Anything such as aluminum or stainless steel (unless dark coloured), will reflect the rays and make your solar oven less efficient) I’ve experimented with a variety of pots, including a cast iron Dutch oven, however, the downside here is that cast iron is so heavy even when empty, that lifting the filled pot with food from the oven, is challenging (and backbreaking!). 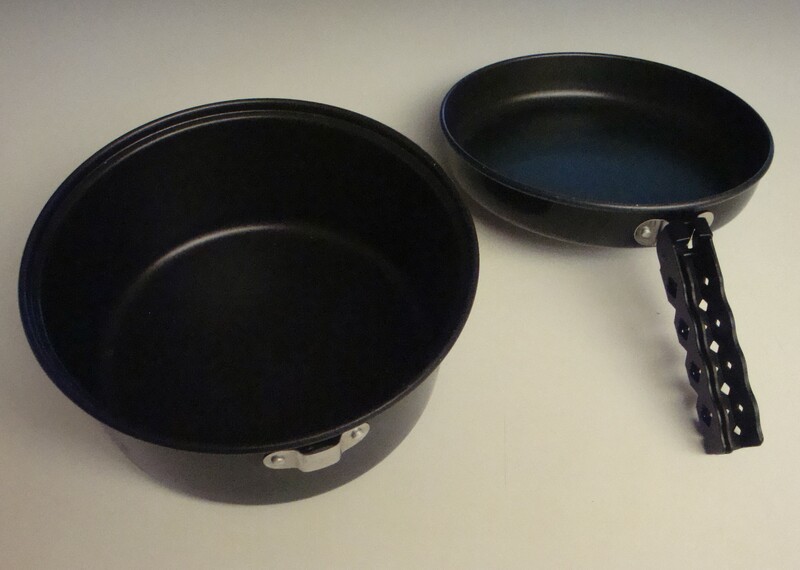 I found some suitable black camping pots with removable handles from a local sporting goods store. The top of the lid (which can also be used like a frying pan), was aluminum so I spray-painted the bottom of it with heatproof black paint, like that used on barbeques. 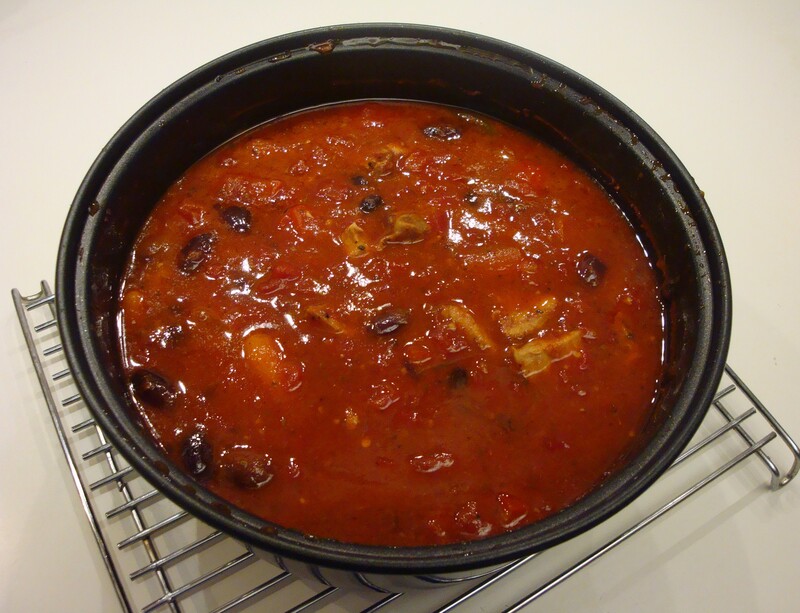 Just like slow cookers, the temperature drops every time the lid is opened, so I usually don’t open the lid until about 2 hours into cooking, to check the progress. Also, as the food cooks and gives off steam, this will collect on the inside of the glass lid in the form of condensation, which will tend to block out the reflected rays and slow down the cooking time. The manufacturers recommend putting a matchstick between the glass lid and the rubber gasket, just to leave a tiny place for steam to escape. My stew went into the solar oven at 1:45 pm (Mountain Standard Time). I first checked it at 3:45 pm and it was steaming and bubbling. At 4:45 pm it was done, and about that time, I stopped refocusing and let nature take it’s course. I served it up at 5:30 pm (the last 45 minutes it was not in direct sunlight), but it was still hot and steaming. 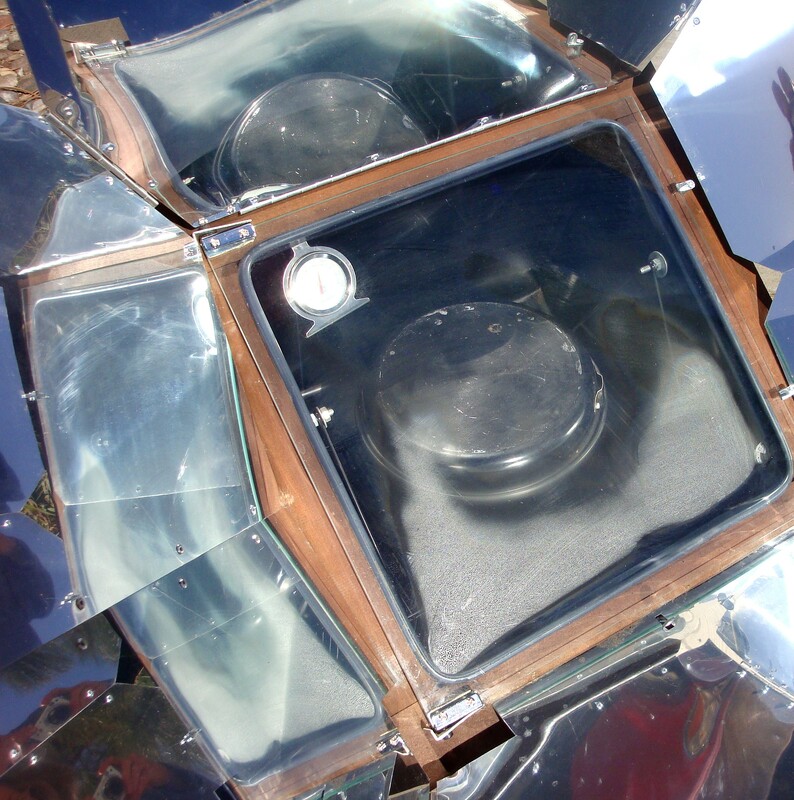 Be green…get a Solar Oven! This entry was posted in Cookbooks, Cooking, Cooking Technology, Eating, Food Trends, Recipes, Uncategorized and tagged Albuquerque, cookbooks, Cooking, Cooking with Sunshine, Ecocuisine, Global Sun Oven, New Mexico, Solar Cooking, Solar Oven, Southwest, Sue Jimenez. Bookmark the permalink.